As I no longer play the game or will put time into playing it, I choose to abandon the project but will leave it open for someone else to take over the project. Contact me on Twitter @PhaxeNor if you wish to take over the project. Require: Carbine GuildAlerts and FriendsList addon to be enabled and loaded. If not this addon will not work at least until I find a better way to handle the events. 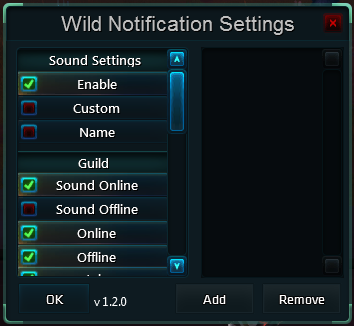 This addon will let you change settings for different settings around Guild and Friends notifications. It will let you disable the most common notifications like "Player has come online" and "Player has gone offline", including sound notifications like the "Click" sound when a member comes online in the guild. - New in 1.1.0: Name sound for when your name appear in the chat. Use /wns or /wildnotifications to bring up the settings window. From here you can enable or disable settings to what you see fit. Custom Notification Type will let you add player names to a list that will be used for online and offline messages. Only the names on this list will be shown. Sound settings works only for the list too then.